Do you ever have a freeze frame moment? A moment where you are both in the moment and also watching the moment from the outside? It's a crazy concept and hard to describe, but you know when you're having one. Trust me. When I think back to some of my strongest memories from adulthood, many of them were freeze frame moments. Times when things were good, and I knew they were good. The other thing that I have figured out about my freeze frame moments is that they typically involve regular, nothing-special, daily-grind moments of my day. They're never the moments when I've planned some picture perfect outing or when I feel like I'm being a rock star mom. That's what makes freeze frame moments so special. 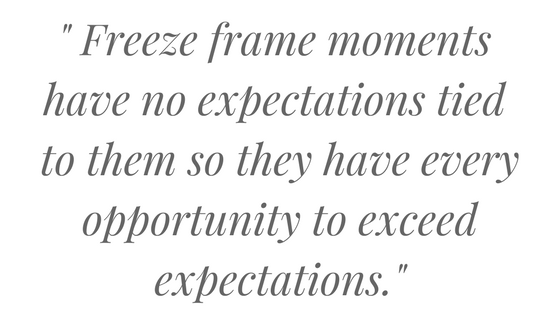 They have no expectations tied to them so they have every opportunity to exceed expectations. Take last night: I was standing in the kitchen throwing dinner together, drinking my wine, and listening to my husband and kids play in the other room. Music blasting, baby squealing, toddler talking, and I was...smiling. I was thinking, man this life is good. I was soaking up everything about that moment while also looking in on the scene, capturing it all and filing it away for the future. For a day when things maybe don't feel as good. It got me thinking about appreciating those small moments. About being in the moment so deeply that it's unlikely you'll forget it. I read lots of articles about quantity of time versus quality of time with our kids. About staying at home versus working. And what I realized from my own freeze frame moment was, it doesn't really matter. It doesn't matter if you work or if you stay home. What matters is that you are present in THE moments of your life with your kids. That you appreciate life when it is good. And when it doesn't feel as good, you draw on your freeze frame moments to get you through. Because you recognize that you will come out of it tomorrow, or next week, or next month. You will. And there will be more freeze frame moments. So as my freeze frame moment was coming to a close, as I was coming back to reality, to the pan that was heating on the stove top, Stevie Wonder's "If It's Magic" started playing on the record player. Like a scene out of a movie. Because not only is this song part of another freeze frame memory I have with my dad, its lyrics perfectly complement this concept. Keeping danger from a child.